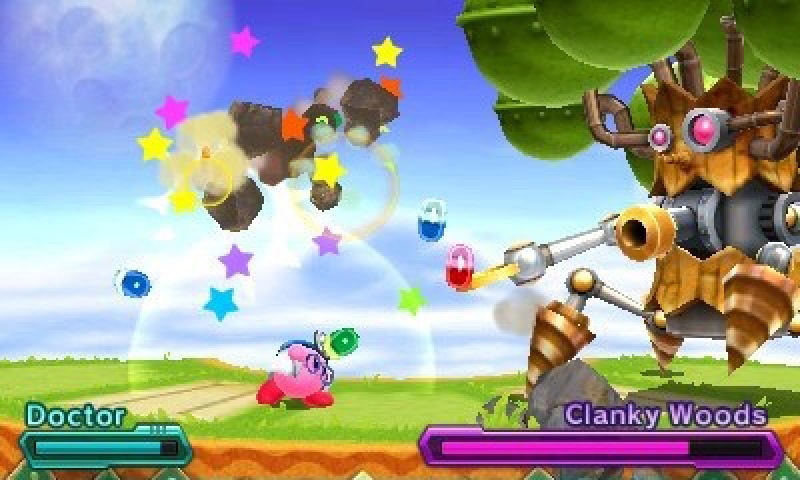 Kirby: Planet Robobot is the second Kirby title to hit the 3DS, after Kirby Triple Deluxe. While Robobot uses many of Triple Deluxe’s assets, it improves on its predecessor in nearly every way, creating one of Kirby’s best adventures in years. 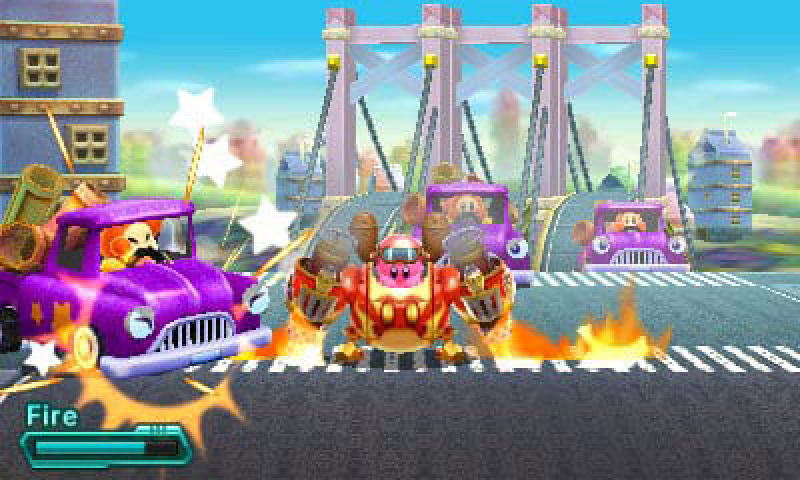 The main story mode of Kirby Planet Robobot sees Kirby’s home world of Pop Star invaded by the Haltmann Works Company and its army of robots, who wish to convert the planet and its citizens into more machines. Naturally, it’s up to Kirby to save the day. While that may not be much of a plot, the game benefits from it in terms of aesthetics. 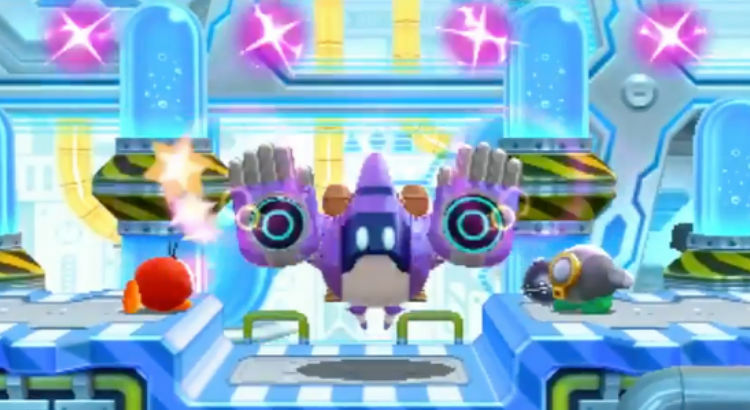 Though it runs on the same engine as Triple Deluxe, Planet Robobot’s robot motif gives the Kirby universe a fresh twist. Environments are either partially or completely converted into metal worlds, and even classic Kirby enemies get a robotic makeover. Kirby can still eat enemies and gain their powers, with most of the usual checklist of powers being accounted for, along with three new ones. The EarthBound-inspired PSI Kirby, the devastating Poison Kirby, and the relatively underwhelming Doctor Kirby. While Kirby’s usual gameplay remains as fun as ever, the biggest twist to the gameplay also stems from the game’s robot-centric theme. In various points of the game, Kirby can pilot his own Robobot, a powerful mech suit reminiscent of those found in Mega Man X. While the Robobot Armor gives Kirby strong physical attacks, it’s best feature is that it, like Kirby himself, can copy enemy abilities, effectively doubling the number of powers in the game, and putting new spins on old classics. Though the Robobot Armor doesn’t appear on every stage, it proves to be a meaningful game changer. It’s up there with Kirby 64’s combined copy abilities as one of the best gameplay additions in the series history. Hopefully it will make a return in some form in future installments (come to think of it, the same goes for the combined powers concept as well). Also like Triple Deluxe, Planet Robobot takes full advantage of the 3DS’ 3D visuals. Many of the game’s stages emphasize the differences between the foreground and backgrounds, with its best levels and puzzles keeping the player involved with both perspectives at once. It joins its predecessor, Pushmo and Super Mario 3D Land as one of the few 3DS games whose gameplay benefits from having the 3D turned on. One downside to the game is that, while Triple Deluxe made full use of the 3DS in ways other than visuals – with a number of puzzles requiring the use of motion controls – those elements have all but disappeared from Planet Robobot, save for a few very brief instances near the end. It isn’t a big complaint, but considering how Planet Robobot builds so strongly on almost everything Triple Deluxe started, it’s a shame that such a prevalent element from Triple Deluxe seems nearly forgotten and tossed in at the last minute. The main adventure alone is incredible, with great level design that takes full advantage of the classic Kirby gameplay and Robobot’s new additions, sharp visuals, an infectious soundtrack, awesome boss encounters (including a thrilling finale), and some good replay value with collectible stickers (which can decorate the Robobot Armor) and Code Cubes (a few of which are required to reach each world’s boss, with the rest unlocking secret levels and one-hundred percent completion). But, as has been Kirby’s trend for a few years now, the game boasts a number of additional game modes for even more content. 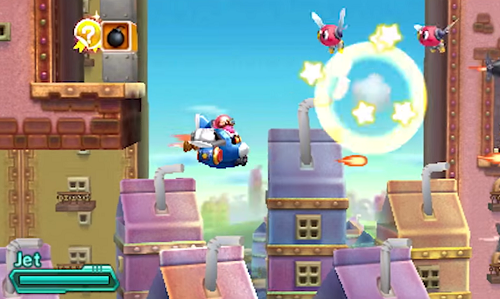 From the get-go, players can select two other play modes: Team Kirby Clash and Kirby 3D Rumble. Team Kirby Clash is a fun combination of RPGs and fighting games, where up to four players can team up to take on large bosses (found exclusively in this mode) as one of four different classes, based on the Sword, Hammer, Doctor and Beam powers from the main game. Meanwhile, Kirby 3D Rumble places Kirby in a series of micro-levels played from a top-down perspective, where Kirby relies solely on his ability to inhale enemies and objects to rack up points and combos. While these modes are both fun and add to the game’s content, they sadly don’t have too much replay value. The list of bosses found in Team Kirby Clash is rather short, and Kirby 3D Rumble can be completed in a few short minutes, and only those who want to beat their record times will have much incentive to go back. On the plus side, there are a few other modes that can be unlocked after completing the main game, so the variety keeps coming. Kirby: Planet Robobot is one of the best Kirby titles in years. It takes most of what Triple Deluxe accomplished, improves on it, and adds some fun tricks of its own. The additional modes may leave you wanting a bit more out of them, but Kirby’s rarely been as fun as he is here, paired up with his delightful Robobot Armor. I don’t think I prefer this over either Returns to Dreamland or Triple Deluxe, but it’s a solid game none the less. I think of the bunch of new traditional Kirby’s my favorite is still RtDL merely because it had a bigger impact being the first more traditional Kirby since Squead Squad, which was just okay. I’ll have to disagree with you about doctor though, that was my favorite powerup of the new bunch. Awesome review! I wasn’t sure whether to pick it up, but it’s hard to resist the Robobot! Kirby games usually make you feel powerful since they’re pretty easy, but the Robobot just sounds so beastly (in a mechanical way). Thanks for informing me on the newest Kirby! Next Next post: 1000 Likes!